Hello Everyone! Are you in the mood for something intensely chocolatey? I discovered this recipe for Olive Oil & Sea Salt Brownie Cookies on Oprah.com. Baking with olive oil is a joy because there’s not much fuss. Also, olive oil makes these cookies lighter than if they were made with butter. 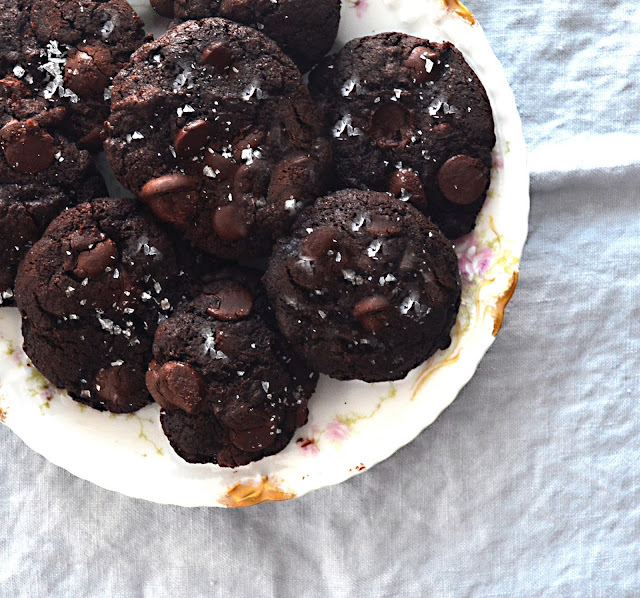 Thank you Katie of Butterlust for giving us this to die for dark chocolate cookie recipe. The cookies remain soft if kept in an air tight container. I can't seem to resist them for breakfast with a good cup of coffee. This recipe is a keeper! The recipe produces not-too-sweet cookies, with a good amount of savory hints from the bittersweet chocolate chips and flaky sea salt. Some people commented on the original recipe, stating there's too much salt in the cookies. I haven’t found that to be true. I like that they're salty, savory and sweet. The key is using sea salt. Sometimes I add freshly chopped rosemary to the cookie batter. The subtle pine flavor of rosemary is wonderful here. I first tried the winning combination of rosemary and dark chocolate in Heidi Swanson's Rosemary Olive Oil Cake with Dark Chocolate Chips. Both the cake and the cookies remain in regular rotation around here. I reduced the amount of sugar in the original recipe from 1 cup to 3/4 cup. 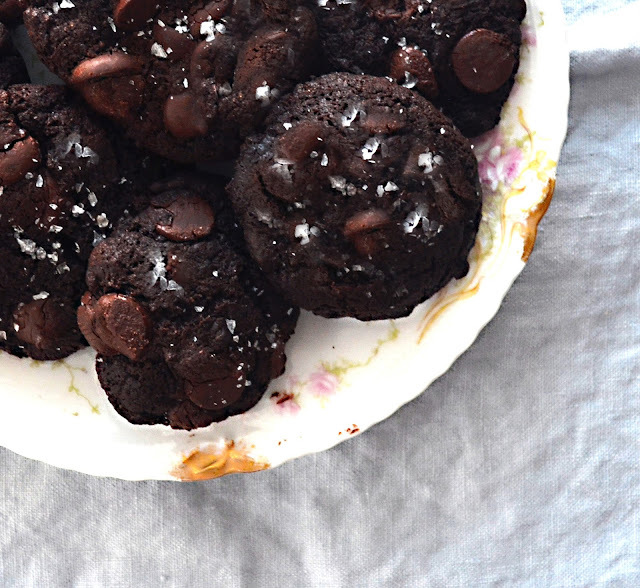 My cookies are sprinkled with Maldon sea salt flakes, which highlights the dark chocolate flavor. I used Ghirardelli Bittersweet Baking Chips in this recipe. I adore them for their deep chocolate flavor. You can keep the batter in the fridge overnight. The batter looks a bit glossy like ice cream. It firms up as it cools in the fridge. Sometimes I add a tablespoon or two of freshly chopped rosemary to the batter. With a wooden spoon or an electric mixer beat the olive oil and sugar until well combined. Add the eggs, one at a time, mixing well between each one. Add the cocoa powder, flour, and sea salt and beat until a dough forms - it should be the consistency of a thick brownie batter. In a small bowl, dissolve the baking soda into the hot water. Add dissolved baking soda and vanilla and beat until well combined. Refrigerate the batter for at least 30 minutes, up to overnight. When ready to bake, preheat oven to 350 degrees and line baking sheets with parchment paper. Use a measuring spoon to scoop to scoop out heaping tablespoons of batter onto your prepared baking sheets and sprinkle with Maldon Sea Salt Flakes. Bake for 10-12 minutes, or until edges are set. Let cool completely on the baking sheets then transfer to a wire rack to cool.